The beginning of a New Year marks a time when everyone is goal orientated. This can involve getting organized, re-evaluating product or service development, and launching new products and/or services. Launching new products, services, and events is exciting, but you should be strategic about it. Promotional avenues can include blogs, social media, e-newsletters, print newsletters, press releases, posters and flyers, radio interviews, TV interviews, a web page or splash page, a release party, affiliate marketing, and good old fashion word of mouth and networking. Timing these activities can be crucial, especially if you want to offer special discounts for early subscribers or pair it with any other programs. Consider a minimum of 6 weeks when planning a launch sequence for any new product or service. 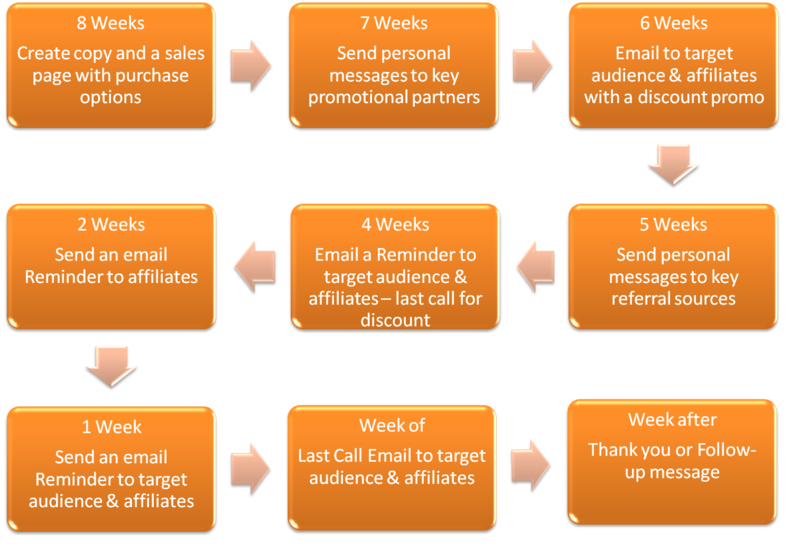 Ideally, you would have 8 to 12 weeks for promotion and marketing. Of course much of your strategy and the promotional avenues you choose in your launch sequence come from knowing your customers and ideal client profile. Proper planning yields proper, successful results. Do you have examples of successful promotional activities, or stories of launches that have not gone as planned?